I am showing this up here because this is what I thought best approach to SoC (Separation of Concerns) in your web forms application. But when I started understanding MVC architecture, I was thinking that this was something I have tried to do Web Forms. But it is better not to reinvent the wheel. 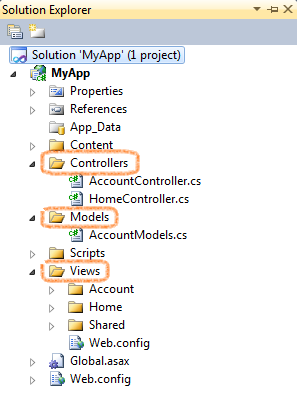 More I spend time working with MVC, more I getting convinced to use it in my next project. Things were pretty much straight forward and everything I need is there. See below screen capture of default folder structure of ASP.NET MVC Application. There are three main folders which are highlighted in image: Controllers, Models and Views. This explains the whole MVC thing. 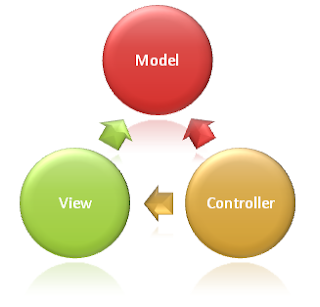 Controllers are those which compile the request the pass the control to requested View with data from Model. Models consist of data entity classes. Views are pages which will be returned to User. See the below image which explain what I am trying to say. No ViewState, Postback and page events etc. Thanks for this article charandeep . Well, this article clear the concept what MVC could be but still need more information, hopefully we will update together. Bunch of Thanks. Good job buddy! You should post more often.